This page is dedicated to Nem foundation Mars. Famous foundation who belonged to Kalinina M.V from Kotofei club. 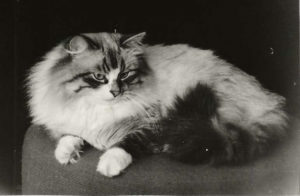 Mars was presented as a house cat in his first cat show 8th/9th May 1989. Other colourpoint foundation cats like Ricky and Selina were also presented this same year . Selina was registered first as a Balinese and later transferred to Siberian stud book at the Riga show, September 23rd and 24th 1989. Another well known Nem foundation who also was transferred from Balinese stud book at the show taking place in Moscow September 7th and 8th was the male Boyz, born in 1988, owned by Irina Gorinova. Boyz, after being transferred from balinese to the “Siberian” breed and was shown later as Nem. Nem was created from Scratch with cats that could well belong to others stud books like Selina, Boyz who were first registered as Balinese or Mars who looked much closer to other breeds than to a Siberian. To nem breeders “Siberians” are clearly a mix between several breeds and this is why NEM was known for so long as “Russian Ragdolls” and it is a “man made” breed like most colourpoint breeds are since the only natural colourpoint cat is the Siamese. It is also a matter of “interests”: nem sell well and there was a big demand for the “exotic looking” cats as the real Siberian were mostly less attractive being simple brown tabby cats. 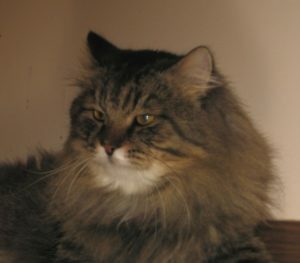 Nem breeders and mixers are also overly preoccupied about show results and looks since there was no real concern regarding genealogy since the cats were already the result of a mix of breeds while most Siberian breeders take real interest in the cat’s genealogy. In another hand, you have those breeders who could grasp the real Siberian cat, the natural cat either because they simply happened to owe one or because they were more interested in this scientific approach regarding its origins (or both). The definition of “natural breed” or “native breed” : population of native animals that are the product of a spontaneous selection in isolated areas, bearing common phenotype. So you have totally different groups of breeders with totally different goals and interests, fighting for the same name or “appellation” which is “SIBERIAN”. I will create an specific page to show all these initial foundation cats. Going back to Mars: we accept cats with Mars at foundation simply because we know that the Siberian breed had this messy start and there is nothing we can do about it but some of our good traditional lines, that show consistent traditional work had been built with Mars at foundation, and since genetically speaking, having one Nem at foundation, will not affect the good work done afterwards (especially now that we can test our cats) we decided to accept Mars, Nyusia and Maks at foundation in order to take profit of these beautiful bloodlines and to avoid narrowing gene pool unnecessarily. Cats with one of these three nem at foundation are group 3 and accepted in our project and program.